Here are some links to useful websites with activities for the children to complete to support their learning. There are also links to useful support and guidance for parents. Welcome to Ducklings class! The children are settling into their first year at school really well and we are all very excited about the adventures we will have together this year! Welcome Back! We hope you have enjoyed a peaceful Easter break and are ready to begin the busy Summer term in Reception! We have been learning about 3D shapes. We found that lots of shapes had been hidden in our sand tray and we played a guessing game before digging them up. We had to describe what we could see and try to guess which shape it was before it was revealed to us. As part of our RE this term, we have been learning about Pilgrimages, which are special journeys that bring you closer to God. We took part in our own St John's pilgrimage to St Alphege's church. On our way, we completed several activities to help to bring us closer to God. We dropped pebbles into a bowl of water and watched the ripples disperse as we let all other thoughts leave our mind. We took part in 'Fizzy Forgiveness', watching our worries fizz away. We made pipe cleaner people to place on the world map as we prayed for people around the world who are not as lucky as us. Finally, we remembered how much God loves each one of us and thought about how special we all are to God. To get our new project 'Journeys' off to a flying start, we took part in a workshop run by The Egg Theatre. During our workshop, we joined in with lots of different activities as we traveled around the world. We visited the Arctic and pretended to be penguins, passing our eggs between our legs. Then we swam through the ocean, trying to avoid the octopus. Finally we climbed up to the top of a tall mountain and listened to a story about a yeti! Happy New Year! We hope that you all enjoyed a peaceful Christmas and are looking forward to all that 2019 has in store! Curriculum Overview - Let Me Entertain You...at the Circus. Project Letter - Let Me Entertain You...at the Circus. To finish our project, the children in Ducklings and Hedgehogs put on their very own 'St John's Circus'! We had lots of parents in the audience, who were super impressed with our skills! We sang a circus song, told a circus story, and performed our circus skills. You can hear a clip of our song above! Our project started with a letter from Ronnie the Ringmaster. The circus performers are all sick and he has no one to run his circus! He wondered whether the children in Duckling and Hedgehog class could help. Of course, we said yes and set about finding out all we could about the circus! Luckily Sally from Kidzfun was around to help us out! She ran a fantastic circus skills workshop for us, during which we learnt to balance balloons and feathers, spin plates on our fingers, juggle with scarves, perform a ribbon dance and lots more. The children thoroughly enjoyed the workshop and are looking forward to putting on their very own circus! We have really enjoyed our drumming lessons this term. We have been learning how to listen to and repeat different rhythms and also created some of our own. We made music to match the movements of different animals and learnt how to make the drums 'talk'. Thank you Justin, for teaching us! Welcome Back! We hope you have had a wonderful half term break and are ready for a very exciting term ahead. Curriculum Overview - Can you build it?...Pirates! Project Letter - Can you build it?...Pirates! Our term began with a pirate's treasure chest appearing in our classroom! It was from Pirate Pip, who needed our help to look after his chest whilst he went looking for more treasure. He set us some great pirate challenges and rewarded us at the end of the project with a 'Pirate Party'! We made sure that we looked like pirates, sounded like Pirates, and had fun like pirates!! We worked really hard to learn the songs and actions for our first Nativity. 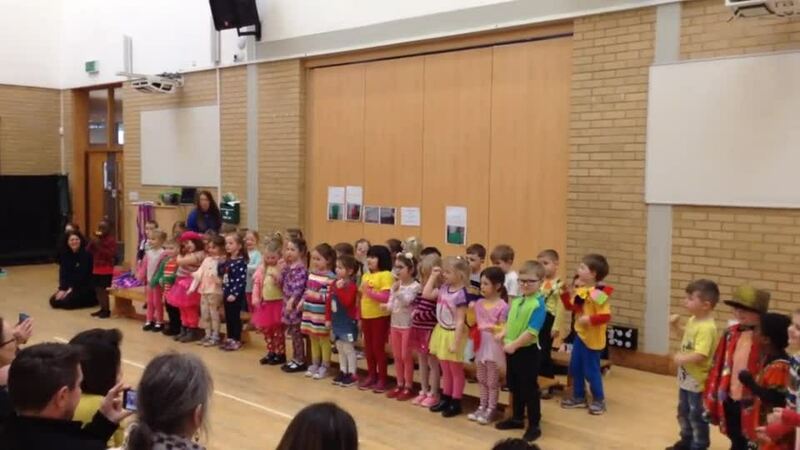 We dressed as shiny stars and performed 'Calypso Kings' on the stage, in front of all of our parents and carers. They were very proud of us! We have been busy getting ready for Christmas. We worked together to make and decorate mini Christmas cakes for our families and celebrated the end of term with the EYFS and KS1 Christmas party. We enjoyed playing games, dancing and eating party food. Happy Christmas everyone!! Welcome to your first term at school! Get ready to make lots of new friends, have fun and do some amazing learning! We have been learning to tell a maths story called 'Ali the Alien'. We learnt the actions and words for the story before setting off on an alien adventure around the school, collecting stars for Ali's spaceship. We had a special music lesson with Justin. He taught us how to play a djembe drum, from West Africa. We had lots of fun playing the drums, following rhythms and moving to the music. We can't wait for more drumming sessions later in the year! We have been having lots of fun exploring our wonderful outdoor area. We have enjoyed playing in the mud kitchen, performing songs and dances with our musical instruments, searching the grass area for minibeasts, fishing stars out of the water tray and much, much more!